There’s no doubt in my mind that the perfect form of travel is by train. In fact, I’ll take a 16 hour train over an 8 hour bus or 1 hour flight any day, as long as the price is reasonable. 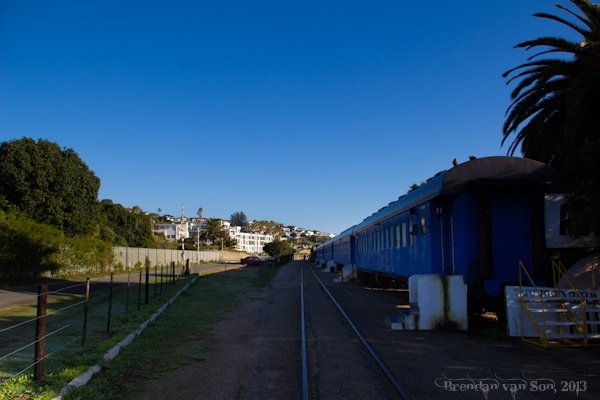 Thus, as I concluded part 1 of my South African roadtrip in East London, and had to get to Johannesburg, I opted to take the little known train system that connects the two cities. I didn’t have any photos from the trip, so this is another photo of the train hotel. An aging beauty, the incredibly large train waits in a dingy station in East London. It’s almost dramatically vintage, like the uniform of a 1990s basketball team. It’s coloured in bold, but fading, purple and blue. And as it rumbles out of the station it jolts and bumps. The train car is open and like the outside it is smeared in a shameful shade of 1990s purple and bold blue. The seats are some form of leather, or maybe just plastic. They are comfortable enough, and though the train windows are scratched and, like much of the train, need replacing, there is something endearing to the classic 90s feel of the train. The views through the train too aren’t all too shabby. I share my car with a business man from Port Elizabeth. As soon as the train leaves the station he reaches the cord to his plug-in his tablet, and shrugs when it doesn’t work. We are left with on options but to sit, and chat. I occasionally lay back and read a magazine, or play a game on my phone, but the casual conversation is a nice distraction to the 16 hours of travel. Unlike a bus, you can lay back and relax on a train. If you need to stretch you can wander through the halls and escape for a bit at stops. And if you’re tired, you can actually lay out to 180 degrees and sleep. No matter how slow, or how much of a modern relic this train from East London to Johannesburg may be, it beats even the most modern bus. A young lady with dancing hair knocks on the door and offers us a look at the dinner menu. This train from East London to Johannesburg has the character of a dying man, and the same amount of stories to tell. And if it were any different, I wouldn’t have a story to tell either. Sure, the luxury I’d become accustomed to on the first leg of my South African road trip was nice, but I find stories in these old travel warriors, not to the ease of luxurious life. And as nice as luxury might be, I live for the stories of when it was interesting, not the comfort of when it was easy. I want to take the slightly fancier, but not fanciest, version from CT to Joburg. Sounds like this version uses the hand me downs from those. Yet still, if it’s comfortable that’s really all the matters and more fun than a flight. Like you, I’d choose a 16 hour train over an 8 hour bus, I just wish there were more opportunities for that in South America! I’d love to do this journey you describe, especially because it starts in East London, which is where I’m from…sort of – the one in the UK! I took the 28h train ride from Cape Town to Jo’Burg. It was a interesting experience but probably won’t do it again – it was do damn cold!